Climb The Hill is an annual advocacy event hosted by the Access Fund and the American Alpine Club to educate Congressional representatives, policymakers, and top land management administrators on the importance of public lands, outdoor recreation, and improved climbing management. For the first time, the issue of facilitated access was part of the playbook for Climb The Hill. This can be attributed to work done by Coalition for Outdoor Access (COA) and other organizations to bring commercial permitting and facilitated access onto the national political radar. 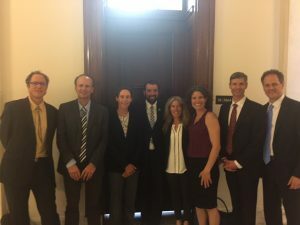 Capitalizing on this momentum, a team of six access advocates from the AMGA and COA met with the National Park Service, US Forest Service, and Senate staffers to advocate for improvements to the permitting system and seek support for bills introduced by legislators in Congress. Current bills include the Recreation Not Red Tape Act and the Public Lands Recreational Opportunities Improvement Act.